This slot, with one win line across four reels, is the online retro version of the Swiss slot machine of the same name. 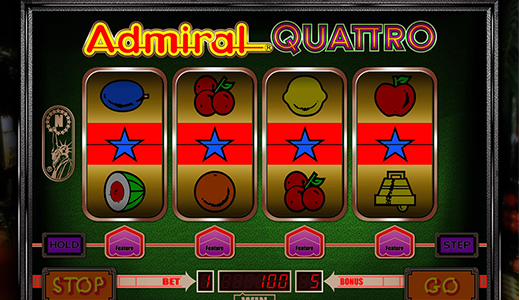 We are proud to offer the masterpiece Admiral Quattro™ in our online casino, for it has the potential to become a cult classic. Get the reels spinning for the first time and you’ll soon discover why! With surprises like the Mystery Roulette feature, Hold feature and Nudge feature, there’s no shortage of treats for you to enjoy. And what classic slot game would be complete without classic symbols? The most lucrative in the game are three BARs, followed by two BARs, one BAR and the Bell. The Star symbol is a Scatter. Plus there are plenty of colourful fruits to light up the reels! In Admiral Quattro™ online it is your goal to try and get three or more matching symbols side by side on a win line running from left to right. Manage that and you’ll be in for a win! Even if luck isn’t on your side, you’ll still get something back, for this game refunds 10% of your stake as a mini bonus for every unsuccessful spin. Moreover, the Hold and Nudge features can be triggered at random at any moment while you’re playing to give your gaming balance an extra boost. And for the most daring gamers there’s the gamble feature, which gives you the chance to double your winnings. In this slot game you stake and win coins, and define the value of a coin yourself. The paytable displays winnings in coins, which are then multiplied by the corresponding currency. The Hold and Nudge features are activated at random, giving you the chance to pocket even more impressive winnings. These bonus games are free. If you get a Nudge, you can use it at the end of a spin to push a reel down and hopefully complete a winning combination. If you get a Hold, you can use it to fix a reel in place. This can be handy if you already have a particularly valuable symbol you want to make the most of. Almost every time you get three or four matching symbols, the Mystery Roulette feature is triggered, sending coloured arrows spinning in circles. Once the arrows come to a stop and the “Stop” symbol appears, your win will increase to 50 or 100 coins. You will receive your initial winnings whatever the result of the feature. In other words, you cannot lose! When it comes to the gamble game, it’s a case of double or nothing. Winnings up to 100 times your stake can be doubled! You love retro games and the classic atmosphere of a traditional casino? 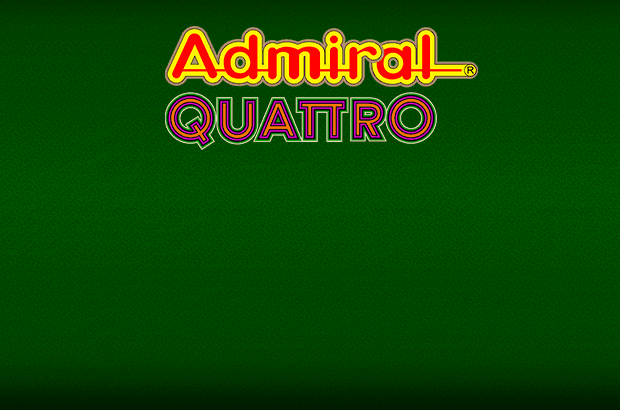 Then Admiral Quattro™ is the game for you, for it delivers everything fans of traditional slot fun could ask for: four classic bonus games and the hit gamble feature. This stylish slot fits seamlessly into the collection of top-drawer games in our online casino!